How do we get out from a relationship?How easily we accept that we are alone? There is a therapy that we can apply to ourselves to overcome the crises? As we know for centuries,poets and composers try to describe in their own way, using art, pain caused by a “broken heart”. Scientists showed the pain caused by suffering in love can be more complex than a simple emotional response. These are just some questions that psychologists and anthropologists have tried to find an answer for yaers. Helen Fisher, a researcher who has studied more than 30 years’ love chemistry, argues that the rejection by the partner and the deprivation of affection triggers changes in our brain. Her studies show that when we are dumped, physical pain is correlated with the emotional. Therefore, a separation can take dramatic proportions. 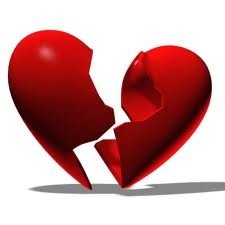 The expression “die of a broken heart”is not just a figure of speech. After separation, people are prone to heart attacks and strokes caused by their depressive states. What happens when a person is dumped? to slipping into his/her ex home to beg to change their minds. Initially most of the dumpee pass through many physical changes that aren`t so good for their body like: smoking in excess, skipping meals, find refuge in food. Women react differently to men. The fact is that both face the same depression as in the case of a death, in this case the death of a relationships. Accepting that we were dumped isn`t spontaneous, but it passes with time with therapy or autotherapy. After a break-up, each part reveals a series of differences between what they they thought about the relationship that their were involved in and what was it in fact. Women get out of a relationship more easil than men who are more proud, more possessive and aggressive in nature. But depression is a personal reaction, some are more affected than others. Therapy for a breakup: women passes the crises through changes in the image and with help of friends. With a new hairstyle and a few pounds less, they had a more active social life. Women looks much better after they have been abandoned and, consciously or not, women are preparing for a new relationship. In contrast, men need physicall effort to remove the frustrations, they are started to make sport and most drowning their sorrows in work. Between love and hate is just one step, say scientists who carefully studied the processes involved in this whole mix of emotions that arise after a breakup. Love and hate are connected in the brain. Brain scans of people who were shown photographs of people they hated revealed intense activity in brain area known as responsible for love feelings. This proves the strong connection between love and hate in real life. Therefore, once a person is lonely, she can express negative feelings towards his former partner. Moreover, it appears that the same brain regions are used to process the emotional and physical pain. Therefore to be rejected by someone is not only upsetting the brain, but can damage the body’s inner balance. However , there is still a hope: the study shows that in time all signals are less active in the brain in emotional adapting.